The club season kicks off in earnest this weekend in Aurora! The first marquee event of the Triple Crown Tour regular season kicks off this weekend from Aurora, Colorado with the Pro-Elite Challenge. Later than the opening TCT events of years past, the Pro-Elite Challenge will be the first glimpse at what’s in store for club ultimate’s top teams this season. With some big roster moves during the offseason and early-season aspirations, mixed teams from across the nation will descend on Denver, eager to start the season strong and be in the “early season contenders” conversation. After dominating the division by losing only two games during the entirety of the 2016 regular season, defending national champions Boston Slow White have already picked up an equal number so far in 2017.1 The division stalwarts lost a lot of the veteran depth that carried them through the 2016 Championship and it appears they will need a longer runway to hit their stride this year. That said, this roster is still brimming with top-shelf talent. Boston returns a solid core with 2016 Mixed Player of the Year Jeff Smith along with fellow All-Club selections Lexi Zalk and Miles Montgomery-Butler; these veterans will try to steady their squad in the first major test of the season. Rookies Mia Bladin, Caitlin Go, and Pat Barron were all studs in the college division this past spring, and the team also adds All-Star Tour veteran Caitlin Fitzgerald. The return of Tannor Johnson may be more important than any single roster loss or addition; the UMass sophomore was one of the best players in the division last year from start to finish and now takes on an even bigger role for Boston. Slow White heads into the Pro-Elite Challenge hoping to work their rookies into their systems and find the right combination of lines to make an early-season statement. Boston is not the only team in Pool A riding a youth movement. Washington DC Ambiguous Grey — who just released their roster on Twitter late last night — also add a bevy of college-aged talent. Tess Warner was huge for Virginia this past spring, Mason Gardner is a big athlete from NC State, and Duncan Fitzgerald is coming off a great year with Oregon Ego. Grey slipped from the Pro Flight to the Elite Flight this season and will be looking for a strong performance in Aurora to solidify their claim as a top ten team in the division. Also in Pool A are the defending tournament champions, Denver Love Tractor. Last year, Love Tractor rode their comfort in the altitude to a surprising PEC title, shooting up the rankings and into the national consciousness. While they were never able to reproduce the same success the rest of the season, Denver will still be hoping for a repeat of their Aurora performance from a year ago. US National Team member Jack McShane is back to lead a squad that has also made some intriguing roster additions, including Arthi Padmanabhan from Heist and Hilary Walker from Small Batch. One of the most noteworthy roster moves in the division going into 2017 is Drag’n Thrust’s loss of Sarah Anciaux. A 2016 Mixed Player of the Year runner-up and All-Club 1st Teamer, Anciaux has been a key spark and playmaker on both sides of the disc for Drag’n for years. Certainly one of the most dominant women on the mixed scene over the past half decade, Anciaux’s departure will surely be a loss for the perennial contenders from Minneapolis. Drag’n Thrust will be turning to seven new roster additions this year to try to help fill the gap, including some major college talent. St. John’s Charlie Schuweiler earned 2nd Team D-III All American honors this spring while Marty Adams from Duluth and Robin Fassett-Carmen were also huge for their teams. The Pro-Elite Challenge will be an opportunity to integrate these new pieces into the squad and put the division on notice that their long run of success hasn’t yet come to a close. That message may be particularly important to send to regional rival Madison NOISE in the last round of pool play on Saturday. NOISE earned a bid to Nationals last season and put up a solid showing in Rockford, but had some uneven regular season results last season. PEC in Aurora was not a high point, as they took some tough losses. With the North Central always competitive, Madison will need to employ their depth and their experience from last year to do what they can to try to earn a bid. Fort Collins shame. is hoping, like Love Tractor, that playing close to home can be parlayed into PEC success. A squad that thrives on the hucking game, their acclimation to playing at altitude could mean they connect on big throws early and often while their opponents adjust. Either way, after a Nationals-qualifying campaign last year, this team — in particular star Jake Juszack — won’t be sneaking up on anyone. 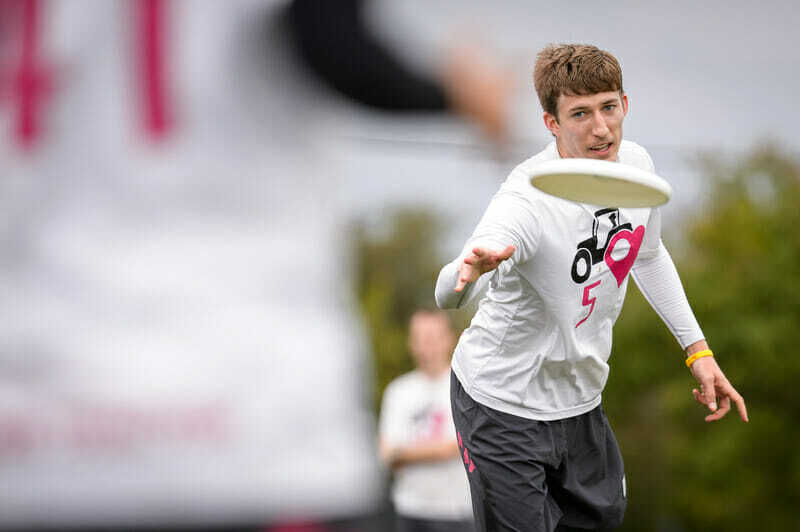 A two-time national champ, San Francisco Blackbird has undergone a major overhaul the past couple years, transitioning to a new leadership group that is hoping to return the team to their place atop the division. With the glut of talent available in the Bay, Blackbird always manages to reload with solid pickups and this season is no different. They have added both some steady veterans in Ryo Kawaoka and John Kolb as well as some major firepower in the form of Jamie Quella and Seth Reinhardt of Revolver and Brianna Cahn from Nightlock, though she may not be ready to play this weekend. Their clash with Cincinnati Steamboat — a rematch of the third place game at PEC last season — could be one of the more exciting matchups in the division on Saturday. Steamboat has steadily grown their program into one of the best in the country, thanks in large part to the contributions of their strong female roster, led by Defensive Player of the Year Nancy Haskell and offensive lynchpin Brittany Winner. This season, the tournament’s overall three-seed will be dealing with weightier expectations as well as a tougher regular season schedule. Minneapolis No Touching, a shock Nationals qualifier a year ago and the third seed in the pool, returns many of their players from last year’s campaign. An older squad who harken back to an earlier era of mixed, they admit that most of their players are planning on using this tournament as warm up for Masters Nationals to be held two weeks from now on the very same fields. Rounding out the pool is Iowa’s Chad Larson Experience, who will have a considerable number of new faces in their squad. Missing out on Nationals for the first time in program history, CLX will most certainly be looking to exact revenge over the No Touching squad that beat them to snag the last bid last year. Pool D promises to be packed with excitement throughout the day on Saturday. Top seed in the pool and 2016’s regular season top ranked team, Philadelphia AMP, has a built a tremendous core of young talent. After losing to eventual champs Slow White in the national quarterfinals last year, the extra year of experience playing on this stage should push that core to another level. But don’t expect them to simply coast through pool play and into the championship bracket in Aurora. AMP’s first test will come in the first round of the weekend against TCT rookie, Dallas Public Enemy. After upsetting Love Tractor at South Central Regionals last season, Public Enemy punched their first ticket to Nationals. They earned some statement wins in Rockford, including beating Pittsburgh Alloy, who beat AMP at Regionals last year. This year, Public Enemy adds some real offensive fire power, picking up 2016 Offensive Player of the Year Chris Mazur. The ultimate community was abuzz last season when he made the move from open to mixed and his presence was felt throughout the season. Now, in a new system, with new personnel, this story line is perhaps the most noteworthy of the tournament. Expect Mazur to be a key part of the Public Enemy offense and as Dallas shoot for for potential upsets against AMP and Mixtape. Speaking of Mixtape, the Seattle squad certainly has the potential to make a deep run this weekend. They’re returning most the key players that have made them a perennial contender and familiar name in club mixed scene. With the return of AUDL star Mark Burton and some very strong women including Ari Lozano and Abbie Abramovich, Mixtape may finally be ready to push all the way to a title. AMP and Mixtape meet in the last round of pool play on Saturday, giving both teams the chance to iron out some early season details before squaring off for the first time this season. Comments on "Pro-Elite Challenge 2017: Tournament Preview (Mixed)"